Are you preparing for Halloween? I know that many of my teacher friends are. I love Halloween because it invites students to nurture their creativity through imaginative activities. Students move in more expressive ways and play with facial expressions. Let’s explore moving like various Halloween characters. First of all, I like to gather students in front of me to teach the vocabulary. I sing the transitional song “Come and Sit In Front of Me.” (by K. Kampa) The professional version of this transitional song is here for you. Come and sit in front of me, in front of me, in front of me. You can print the I’m a Witch picture cards and teach students the following song. Spoken: Let’s be witches and fly on our broomsticks. Hee! Hee! Hee! I’m a witch! 2. Spoken: Let’s be ghosts and float gently through the air. Boo! Boo! I’m a ghost! (3X) Happy Halloween! 3. Spoken: Let’s be bats and fly through the night sky. Eeek! Eeek! I’m a bat! (3X) Happy Halloween! 4. Spoken: Let’s be owls and turn our heads from side to side. Whoo! Whooo! I’m an owl! (3X) Happy Halloween! 5. Spoken: Let’s be black cats. Put on your whiskers and sneak around. Meow! Meow! I’m a black cat! (3X) Happy Halloween! Now it’s time to be creative and move. Decide on the space that your students can move in. I usually start with movement in a circle, and then allow students more freedom to move in an open space. You can use the spoken cues to help guide your students’ movements. Students start by posing like the characters, such as the witch, then move around in a circle. I often tap a drum to the rhythm of the movement. To make it more magical, add the words “Abracadabra! You’re a witch!” When you can see that students have moved enough, say “Stop!” Continue with the other characters. I like to recognize students who are really being imaginative and creative with their movement. Finally, either sing the song acapella or play the song on the CD Kathy Kampa’s Special Days and Holidays. My students love the special effects. If you’re interested in the music, you can download the song from iTunes or get the CD with lyric sheets from CD Baby and Englishbooks.jp. Find more Halloween ideas here on the blog and on my Pinterest page. I love Halloween! It’s a time of year when students can use their imaginations and pretend to be many different characters. The photo above shows me with some of my students. How can your students use their imaginations and expand their creativity? 1. 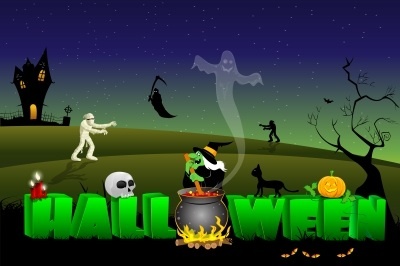 USE VISUALS Build Halloween vocabulary by showing pictures, puppets, or other visuals. These Halloween characters made from recycled toilet paper rolls are a simple way to get started. This first activity is by Artsy Momma. The second one is by Connect English School. Click on the first picture to find more Halloween activities on our Pinterest page. 2. ADD MOVEMENT IN DIFFERENT WAYS Movement is an important way for children to learn. How do you feel about movement in your classroom? It’s important to teach students the commands “Move!” and “Stop!” Games like Simon Says help students learn this important skill, too. 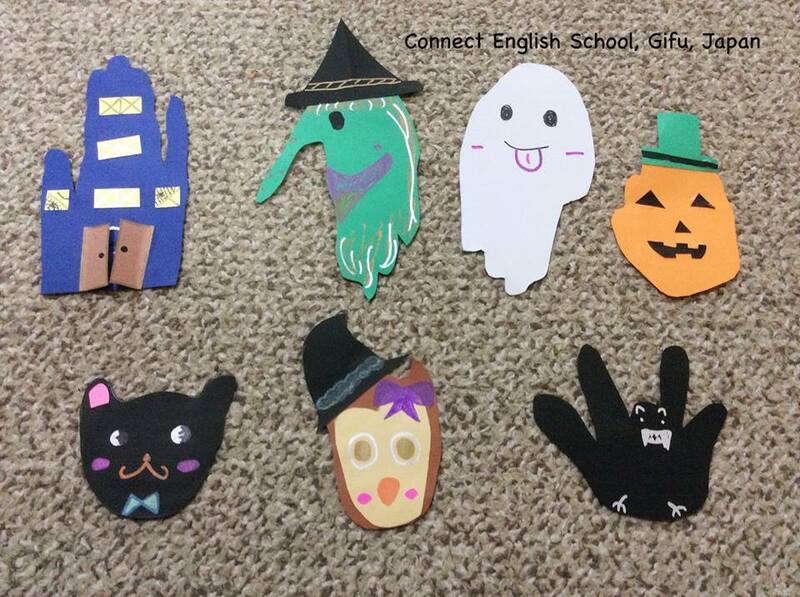 Your students can create movements like Halloween characters. Hold up a picture card and have students make a “pose” in one place. Now students can move around a circle. Say, for example, “Abracadabra! Move like a witch!” Students can move like a witch around the circle. This might look like galloping or flying on a broomstick. You might have students move for ten counts. Count to ten. “1-2-3-4-5-6-7-8-9-10” and say “Stop!” Praise students who have stopped moving. Then repeat with other characters. Witch: Students pretend to fly on broomsticks by holding their hands in front of their bodies and galloping. Ghost: Students move their arms smoothly up and down, while walking in curvy pathways around the room. Bat: Students pull their elbows in to create small wings. They move quickly around the room. My students also like to pretend they’re sleeping bats by folding their arms in and creating an upside-down pose. Owl: Students stand in one place with their arms down. They turn their heads from side to side. 3. ADD PROPS Students can also use their imaginations with costumes or props. With a scarf, a student can turn into a prince or princess, ride a witch’s broomstick, or become a spooky ghost. Pieces of fabric can be used over and over again and made into various costumes. 4. 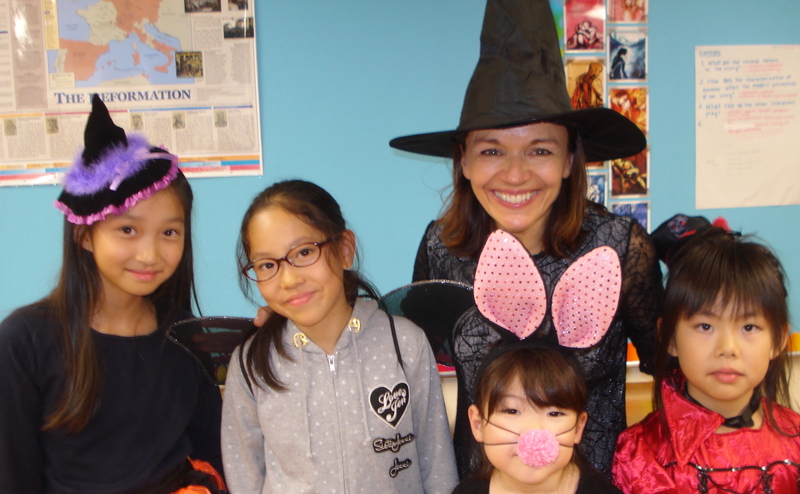 ADD MUSIC My Halloween song “I’m A Witch” prompts students to imagine becoming different Halloween characters. Before we move to the song, we sit down together to listen to it. I sing my transitional song before we start, Come and Sit In Front of Me. I’m happy to provide this FREE professional version for you! Now you’re ready to listen to I’m a Witch. Spoken: Let’s be ghosts and float gently through the air. Spoken: Let’s be bats and fly through the night sky. Spoken: Let’s be owls and turn our heads from side to side. Spoken: Let’s be black cats. Put on your whiskers and sneak around. Show students images of each of the characters in the song as it plays. Using visuals is important — especially for students learning English. This is an important first step in learning the vocabulary in the song. Whenever students are moving in your classroom, check to make sure that everything is safe. Push chair legs in, and move things out of the way. Now students make a circle and move around it. Hold up pictures of each character if they need more practice. Now play the music! Remind students to stop after each character, and listen for the new cues. If your classroom isn’t conducive to a lot of movement, have each student choose one character for movement. You can have students draw this picture, or pass out small picture cards. I hope that your students have as much fun as mine do with this song! Happy Halloween and Happy Teaching! Celebrate Halloween as Marching Monsters . . . Boo! “Alliteration” happens when two or more words begin with the same sound. The phrase “marching monsters” has two words that begin with the sound /m/. 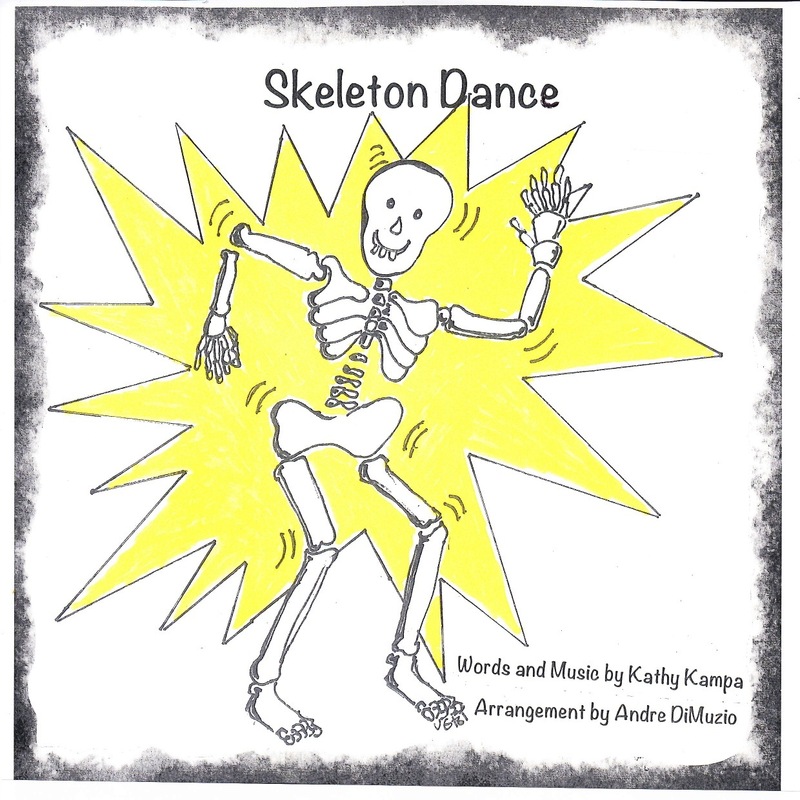 Other phrases in the song include “skipping skeletons,” “waltzing witches,” and “jumping jack-o-lanterns.” Children love to sing these fun phrases while doing the actions throughout the song. They also learn the song quickly because of the repeated phrases. Here is a simple recording of the song. A FUN professional version is available on iTunes here (just click on Track #11). Here are the lyrics, plus notes on how to teach it! 1. Marching monsters! Happy Halloween! Boo! Marching monsters! Happy Halloween! Boo! Students can move around a circle or freely around the classroom. 1. On Marching Monsters, students march around, pretending to be monsters. On Turn around and stop, students turn around and make a pose. They hold until the music begins again. 2. On Skipping Skeletons, students skip around, moving their arms like a skeleton. For very young learners, children can gallop, or they can slide sideways. 3. On Waltzing Witches, students dance in one place. If you’re in a circle, face the center. Students sway from side to side moving their arms. 4. On Jumping Jack-o-lanterns, students jump in one place, making the shape of a jack-o-lantern. Enjoy this wonderful song and dance activity with your students! Kathy Kampa’s Special Days and Holidays, available on iTunes. Let’s Pretend for Halloween–Time for Witches, Black Cats, and More! 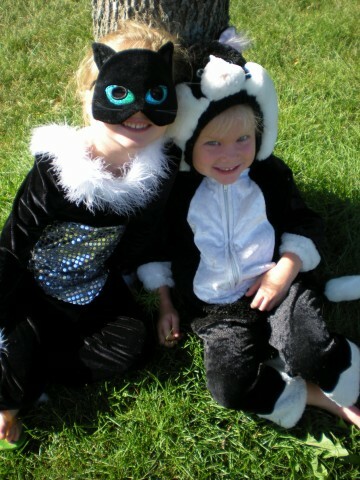 My nieces like to dress up as black cats for Halloween. I love Halloween! It’s a time of year when students can enjoy expressing their ideas. They’re encouraged to use their imaginations and can pretend to be many different characters. How can your students use their imaginations? 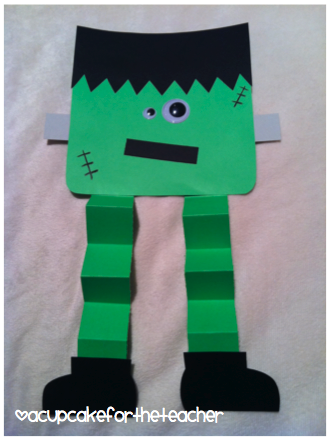 First, you can encourage students to create movements like Halloween characters. For example, students can make a pose while sitting. Then, they can do movements around a circle. Finally, you can let them move freely around an open space. For shy students, demonstrate some simple ideas. Soon they’ll be creating their own ideas. 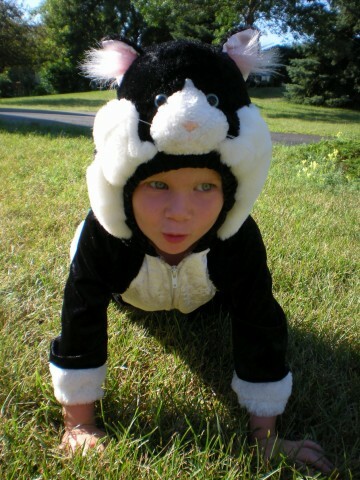 Students can also use their imaginations with costumes or props. With a scarf, a student can turn into a prince or princess, ride a witch’s broomstick, or become a spooky ghost. Pieces of fabric can be used over and over again and made into various costumes. 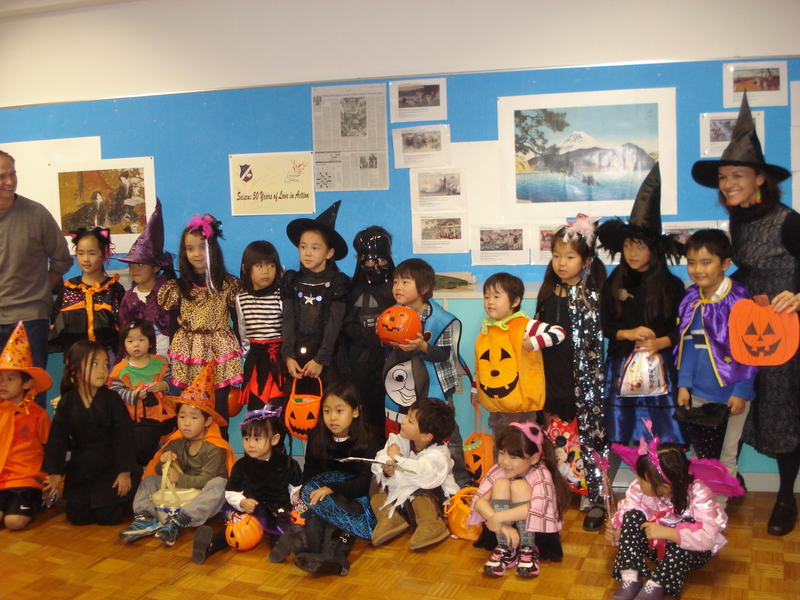 Show students photos of children dressed up to go trick-or-treating. Although many companies sell fancy costumes, I have fond memories of creating costumes from things we had around the house. Here’s a Halloween song I wrote entitled “I’m A Witch.” It prompts students to imagine that they’re different Halloween characters. To teach this song, sit with students in front of you. Show students images of each of the characters in the song — a witch on a broomstick, a ghost floating in the air, a bat flying in the air, an owl sitting in a tree, and a black cat creeping. Using visuals is important — especially for students learning English. This is an important first step in learning the vocabulary in the song. Here’s a simple version of the song. (A more professional version is available below.) You can listen to the song while showing students these pictures. Here are the lyrics if you want to sing along. Now students can stand in a circle, move around the circle, or move freely around the classroom. Hold up pictures of each character. Before playing the music, I like to practice movements for each of the characters. You may want to share your own ideas. Just remember that if you demonstrate the movement first, your students are more likely to copy your ideas. Now play the music! My students love moving freely about the room while they hear the cues. I remind them to stop after each character, and listen for the new cues. I hope that your students have as much fun as mine do with this song!